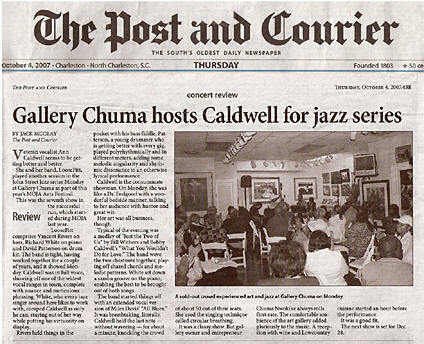 Live Jazz music and Fine arts, featuring Charleston’s finest vocalist Ann Caldwell along with her ensemble “LooseFitt Band” at Gallery Chuma for some cool, relaxing jazz tunes, with friends, great food and wine. Listen as Ann Caldwell interprets the emotions, rhythms, spirituals and experiences encountered in the Gullah paintings through her musical improvisations. Live Jazz Music, Fine Arts, Whisky Tasting and Gullah Food, featuring Ann Caldwell and her band, along with World-renowned Dutch author and whisky expert Hans Offringa at Gallery Chuma for 2 shows only. 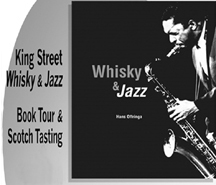 Hans Offringa presents his newest book “Whisky and Jazz” about ten classic jazz pieces and how the music resonates perfectly with some of Scotland’s most tasteful single malts. Ann Caldwell will play music selections followed by Whisky Tasting and commentary by Hans Offringa, as he tells the history of jazz and whisky and how the music and scotch truly blend. It’s been almost a week since I first stepped onto the south and we at the Goldring Program have been working hard. I felt a bit burned out and I was ready to kick back and relax. 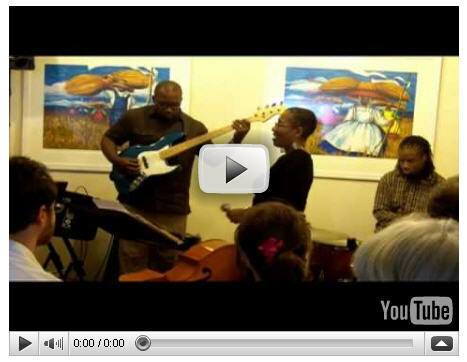 What better way than with a little jazz, an art form close to the heart of Charleston. Scanning through the Piccolo program, I happened to see the words “paintings” and “musical improvisations” in one sentence. I was sold. I was going to John Street Jazz in Gallery Chuma. The hour-long event was well worth my time, not just for the heavy hors d’oeuvres and my first taste of shrimp and grits, but for the cool rhythms that hung inside the gallery like a welcome fog. On keyboard, Richard Harris White, Jr. played the cool cat, his fingers moving lightly over the keys. On bass and bass guitar, Vince Rivers’ notes were the perfect bed for Caldwell’s vocals. On drums, David Patterson, Jr. kept the beat moving onward and upward. Unlike the less than enthusiastic response to the Norma Winstone concert, John Street Jazz is an a musical alchemy gone right. Before you know it, you’ll find yourself eyes closed, feet tapping and head a swayin’ just like you should be. After the presents are all opened and the family visits are over, spend Wednesday night unwinding with fine art and live jazz as Gallery Chuma, 43 John St., downtown Charleston, presents "John Street Jazz." Charleston's favorite songstress, Ann Caldwell (pictured), will translate the emotions, rhythms, spirituals and experiences encountered in the many Gullah paintings on display into music with the help of her friends in the LooseFitt Band. Receptions will begin at 6 p.m. and 8:15 p.m. Show times are at 7 p.m. and 9 p.m. Admission is $15, and $10 for students. Gullah Cuisine will provide wine and hors d'oeuvres during the show. For more information on the concert, call 843-722-7568. Paintings will sing Tuesday at Gallery Chuma. The voice you'll hear, though, will be that of Ann Caldwell, a popular Lowcountry singer adept at spirituals, blues and jazz. Caldwell and gallery owner-operator Chuma Nwokike have teamed to add a twist to the local live performance and visual arts scene. 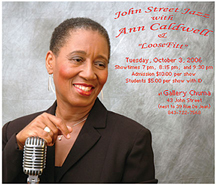 Caldwell and her band, Loose Fit, will perform music that helps interpret some themes prevalent in the art featured at the African-American gallery, 43 John St., next to 39 Rue de Jean restaurant. The show is billed as John Street Jazz. Loose Fit is composed of bassist Vince Rivers, pianist Richard White and drummer David Patterson. There are three performances, 7, 8:15 and 9 p.m. Admission is $10, and $5 for students with ID. "A lot of the paintings in my gallery are about people in the Lowcountry doing their day-to-day work," Nwokike said. "They would use music as a way to make their day go by, a kind of escape to lessen the monotony of the work." Gallery Chuma is the exclusive dealer in Charleston for works by Gullah artist Jonathan Green. Other artists shown are John Jones, Carol A. Simmons and Cassandra Gillens. "That's the gallery's focus," Nwokike said. The goal, Caldwell said, is to entertain and show the links between music and art. "We also are interested in bringing jazz to different kinds of venues," she said. Nwokike said there's already a big buzz about the event. "This is the first time we've done this," he said. "It will be interesting. We're all excited to see how this will play out."